Unless there are fresh developments such as judicial interventions, the All Progressives Congress (APC) will not field gubernatorial candidates in Imo and Zamfara states next year. The name of the party was missing from the shortlists of political parties’ gubernatorial candidates the Independent National Electoral Commission (INEC) displayed yesterday. A source who spoke to The Guardian on the absence of the name of the APC candidate in Imo, said it could be as a result of the internal crisis between Governor Rochas Okorocha’s son-in -law, Uche Nwosu, and Senator Hope Uzodinma, both of who are claiming to be the authentic candidates of the party. But former deputy speaker of the House of Representatives, Emeka Ihedioha of the Peoples Democratic Party (PDP), was among the 67 names on the list, which also included five female candidates. Former governor of the state, Ikedi Ohakim, who had been touted to have secured the ticket of a party, could not be found on the list. Others whose names appeared include Senator Ifeanyi Godwin Ararume (All Progressives Grand Alliance, APGA), Dr. Linus Okorie (Young Progressives Party, YPP), Chief Ibe Unachukwu (Accord Party), Chief Okey Eze (Social Democratic Party, SDP), Obioma Akagburuonye (Action Democratic Party, ADP) and Ikechukwu Ukegbu (Labour Party). Scores of politicians were at the INEC office located along Port Harcourt Road in Owerri, searching for their names. Those who found theirs left in joy, while those whose names were missing left in anger and disappointment. Okorocha has been in a battle of his political life with some APC chieftains in the state bent on stopping him from picking Nwosu as the party’s gubernatorial candidate. The party’s primaries in the state ended in controversy, leaving the party leadership to choose between Nwosu and Uzodimma. 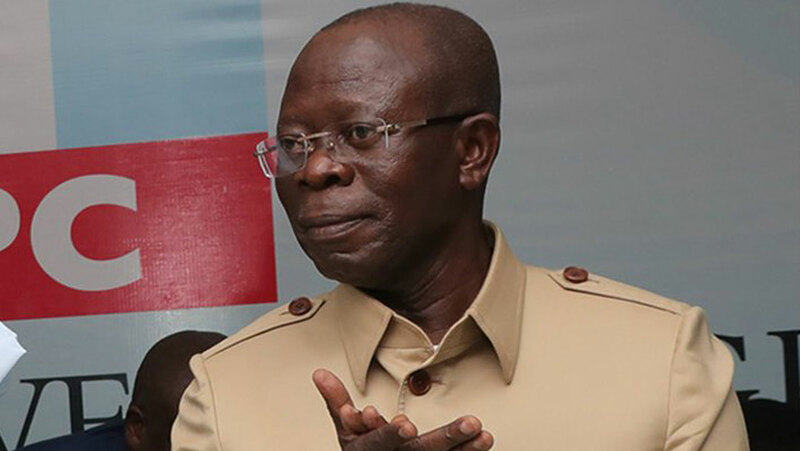 The development had pitted Okorocha against the APC National Chairman, Adams Oshiomhole, to the extent that they have both engaged each other in a war of words. An order of the Federal High Court in Owerri on Thursday, stopping the party from substituting the list of those that won the primaries, might have been responsible for the non-listing of APC candidate. In Gusau, the political parties whose candidates were on the INEC’s list of gubernatorial and state Assembly candidates include APGA, PDP, NRM, SDP, PRP, GPN and NCP. The National Commissioner in charge of Sokoto, Kebbi and Zamfara states, Hajiya Amina Zakari, who was in the state for an official visit, said the commission had not received a list of APC candidates. “I think it has been said several times that the APC didn’t have candidates in the state, so we have not received their candidates. “This issue is in court and if court asks us to go ahead and receive their list, we will certainly receive their names. “Therefore, since the date for the submission of candidates has passed, we shouldn’t go on that now; we should concentrate on what will be beneficial to the communities, which is voter register, claims, objections and verification,” she said. Zakari said she was in Zamfara to see how the state INEC office was doing and to observe and monitor the ongoing display of the voter register, claims and objection. The Party Is In Crisis .They Should Settle Their Problem Amicably. Apc are just messing up sha. The. World waits for the magic of the Emperor of Imo. Let it remain like until other parties take advante to sell themselves to the electorate. APC needs to settle all this problems within so that it won’t lead to their failure in this forth coming election. This doesn’t sound well at all. Is INEC fully set for 2019? If INEC will be truly independent then it will be very nice. We hope INEC will fill in the vacant of these positions. looks like they are afraid of apc.